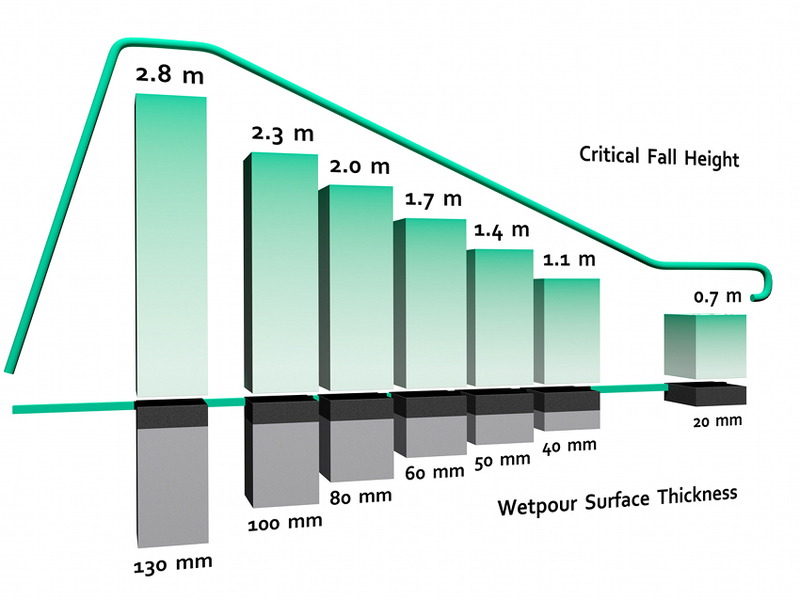 Wet Pour rubber safety surfacing is suitable for playground installations where impact absorbent surfacing is a requirement up to the appropriate Maximum Free Fall Height (see chart below). It can be used around complex configurations of playground equipment and ground contours. 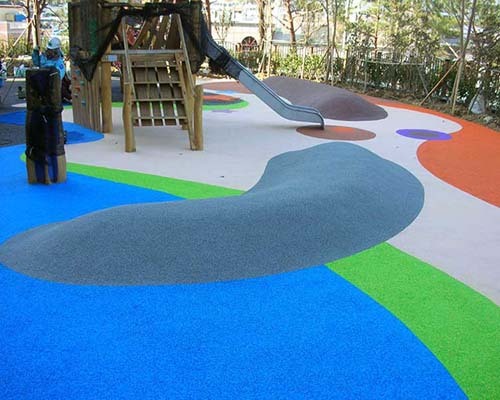 Wet Pour surfacing for playgrounds is slip-resistant and non-abrasive to young children. It is porous, so no puddles. Colourful graphics can be created within the Wet Pour for games or emblems. This is done by designing a stencil and cutting out the top layer colour to replace it with contrasting colours. The Benefits of MonsterMulch Wetpour ! Monstermulch have tried and tested many supply sources for wetpour materials over the decades. We have the aquired expertise to know which materials perform well and which perform poorly over the expected life of a wetpour surface. We can supply and install or we can supply with all technical information you may need to know. The base layer provides the safety cushion effect. It is recycled 2-6mm crumb bonded rubber, mixed on site using special equipment and laid to exacting standards usually 30-50mm with 10% resin. It is relatively cheap costing about £14 per square metre at 30mm (£4.5 per 10mm approx) . The top EPDM layer. Recommeded to be 20mm it is a specifically manufactured polymer of 1-4mm granules designed to be very hard wearing and colourfull. It is more expensive at about £45 per square metre depending upon which colour. Don't worry, we'll calculate the appropriate materials for you ! and install if you wish ! Further technical information available on request. Ideal for creating the perfect finish on large difficult to reach areas. All steel construction 114mm diameter roller complete with 1600mm handle. Available in a range of widths – 400mm, 600mm & 800mm. Lightweight fibreglass construction suitable for containing release agent and light solvent. Measures approximately 870mm long x 330mm wide x 160mm high, weight 2.5kgs. Wetpour long-nosed 400mm steel trowel. Ideal for achieving a perfect finish, particularly for intricate areas, graphics and around surface edges. 2″ Treacle drum tap suitable for dispensing viscous fluids. Cast Iron body with brass faceplate for an excellent seal and easy flow control. Can be dismantled for easy cleaning. Drum trolley and pouring stand for 210 litre steel drums (250kgs). Suitable for most terrains. Measures approximately 1,220mm x 800mm wide x 310mm high. Height of bung 360mm, weight 22kgs. We also stock a static version which is smaller in size.